PLUM KERNEL OIL is one of the best natural skin moisturizers because of its lightness. PLUM KERNEL OIL 100% Pure 0.33 Fl.oz - 10 ml. PLUM KERNEL OIL is very beneficial for plumping and firming the skin. 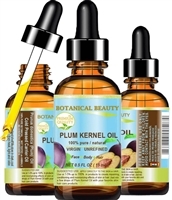 PLUM KERNEL OIL 100% Pure 0.5 Fl.oz - 15 ml. PLUM KERNEL OIL 100% Pure 1 Fl.oz - 30 ml.